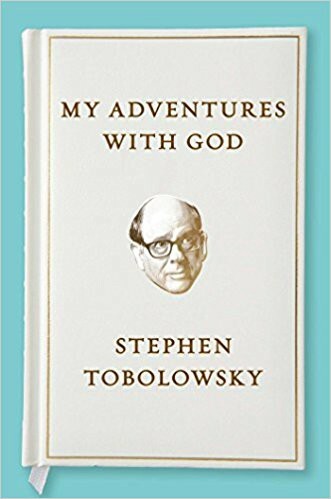 The stories Tobolowsky shares in his book coalesce to form one of the most genuinely optimistic Jewish memoirs ever published. He credits his disposition to his “relentlessly hopeful” mother. But there are other things at work, too: a connection to the fullness of life and an attention to the details that make it complete; a recognition of the holy in the everyday, but also an alert eye toward the truly divine (even if it’s only seen from behind). Who better to contemplate the ineffable than the actor who has given us such a beautifully diverse portfolio of everyman experience? Lou Cove: Let’s start with an easy question: without giving any spoilers, is God real? Stephen Tobolowsky: Yes. Next question. That was a joke. And it is not a joke. People are usually less interested in an answer than the rationalefor an answer. Here is mine. Take something purely scientific. Black holes. They’re probably there. Astronomers now have a couple of indicators of light and gravity that point to their existence. But those indicators would be lost on me. I wouldn’t know what I was looking at, and I can’t feel their presence in my day-to-day life. But that’s irrelevant to their existence. They can be real whether I believe in them or not. Acceptance, like love, usually requires a leap of faith. All of us are trying to see in the dark to one extent or another. We depend on our instruments to sense what can’t be seen. I have been lucky in my life. I have seen and felt the presence of what I call God. In the case of the divine, I trust my instrument: my soul. Next question: is the soul real? LC: What was the genesis of My Adventures with God? I thought about it for a couple of months and came up with a conceit — that all of our lives fall into the template of the Torah, the Five Books of Moses. We all have a Genesis. This consists of the things we usually discuss on a first date: who we are, where we come from, our family, our aspirations, our terrors. Then we all go into slavery, like in the Book of Exodus — but instead of building pyramids, we lose ourselves in first loves or miserable first jobs. Then we break free, only to find that, like the Hebrews, we are still lost in the desert. Then we have a Leviticus moment in the middle of our lives, when we attempt a course correction. We say to the universe, “Stop! This is what I am!” In my life this happened in my mid-thirties. I got married, became a father, and returned to Judaism in a serious way. Eventually, we are shaped by mortality — like in the Book of Numbers. We lose loved ones. Precious family and friends. We may even have a brush with death ourselves. We are remade by grief. Finally, if we’re lucky, we reach Deuteronomy. We tell our stories to our children to try to make sense of the journey, as Moses did with the children of Israel on the border of the Promised Land. What was originally an excuse for a book has become my new worldview. I see the template everywhere in the stories people tell me. LC: Acting versus writing: where does the work overlap and where does it contrast? First, actors have to listen to everyone. We listen to directors, producers. We even listen to writers. Writers don’t have to listen to anyone. Maybe they should, but they don’t have to. Secondly, actors have rules. Lots of rules. On Broadway, you have to say all the words written in the script and say them in the right order. If you miss a line, forget a prop, or substantially change your blocking (your movement), you get written up.Writers have no rules — or rather, they make up their own: when should I start drinking? Before I write? While I’m writing? Or afterwards, as a reward? I have tried all three. They all work. And thirdly: on the television show Silicon Valley, I would often get a 6:18 AM call time. And they meant it. At 6:18, a young assistant would knock on my door to take me to makeup. I would have to do my big scene before breakfast. Writers don’t have to go to work at 6:18. They don’t have to go to work at 10:18. When you are a writer you are always on the clock! The voice in your head never stops. You keep a pad by your bedside in case a line comes to you in your sleep or you want to write down a dream. It is relentless. All of these reasons listed above may explain the existential difference between the two: actors hide their desperation. Writers thrive on their desperation. Both [writing and acting] are largely solitary. It’s true. Most of a professional actor’s life is spent alone. One surprising similarity is that both crafts are largely solitary. It’s true. Most of a professional actor’s life is spent alone. An actor reads his material, prepares his audition, works on his part, learns his lines, and even takes his bow alone. In the theater, the audience can be a barometer, but in film and television, the “audience” is the crew — and they are often an obstacle. LC: My Adventures with God is one of the least angst-written Jewish books I have ever read. So I have to ask: is this a Jewish book? And whether or not it is, to what do you attribute your palpable (and infectious) sense of optimism? ST: Hilarious question. Yes, Judaism is usually associated with tsuris. In the Torah, the Hebrews constantly complain. Many of the stories in the Torah have themes of loss and misery. I feel that the Talmud is almost apologizing when it proposes the concept of “the afflictions of love” — the idea that misery can be a gift from God to enable one to see the world with a deeper spiritual truth. LC: In a similar vein, your first experience meeting and learning from a rabbi was unequivocally positive, and you continued to be influenced in important ways by rabbis in the years that followed. How much of this was your disposition and openness to rabbinical wisdom, and how much was the good fortune of meeting the right rabbis at the right time? ST: Over the last few months I’ve spoken at events where people have told me rabbinic horror stories from their youth. I missed out. Both of my early teachers, Rabbi Klein and Rabbi Schimmel, were first and foremost good people. They were kind. Learned. They saw Judaism as a path to greater richness, not as a set of rules that had to be followed at all costs. An important part of any religious education is learning and following the laws that are held by that faith. Judaism is no exception. But I am an actor. On Broadway you have no Shabbat. You do a show Friday night and two on Saturday. That’s the way it is. It was Rabbi Schimmel who pointed me in the direction of the Talmud, which instructs that in times of difficulty we must “learn to pray on the road.” I doubt if Rabbi Klein or Rabbi Schimmel would have approved of my working on the Sabbath, but I owe my desire to be closer to Judaism to their primary teaching to strive for more and not to punish myself for my deficits. LC: “Trailing radiance” is a recurring theme in your book — a reference to God’s back, and also to the fact of proactive choice-making in life. Talk about how this concept has informed your philosophy and how it came to frame the book. ST: When you write a book in which God is a central character you have a fundamental problem: what are you writing about?The writers of the Torah were wise enough to understand that one needs some kind of poetry to express the unknowable. Seeing “God’s back” is not much different from Thomas Aquinas saying that to know God one must look for the effects of the infinite on man. Both descriptions create a picture of something that is not easily understood. When you write a book in which God is a central character you have a fundamental problem: what are you writing about? We change over time. Our knowledge of God changes over time. You end up with an equation with two unknowns. If you remember Algebra II from high school, equations with two unknowns don’t have an answer. You end up with a graph. The only way I could imagine turning something like that into a book was to emulate the various points on the graph. I was hoping I could create a mosaic of stories that described a larger story. For example, in the Genesis section of my book, I tell the story of when I tried to walk home from the YMCA when I was six. I had no idea that it takes a lot longer to walk than to drive. I had no money. I end up walking for hours. Night fell. The police were called. My parents thought I was dead. Spoiler: I got home safely due to the kindness of strangers. The next story is about another child in our neighborhood who wasn’t rescued. It’s a horror story that haunts me to this day. Two points on a graph. It was my intention that when these two points are placed together, they ask a larger question: where is God? This question dominated my early life. I didn’t know I was only looking for his back. LC: In your book, you describe the experience of intuiting or “hearing” people from your drama teacher’s heartrending past. And it led to a period where you tried to do the same for others. What do you believe is the source of these tones, and do you still hear them? ST: I still hear tones. I don’t have a clue as to why they happen or where they come from. I was surprised when someone who read the book told me that his wife was “afflicted” with the same ability. She always heard tones coming from people. She thought she was going crazy. She went to doctors and got tested. Like me, the more she listened the more she heard until it was overwhelming. That is why I tried to stop using this “ability” in college. I must say that my ESP, or whatever you want to call it, has helped me find things we lost. It helped me find my wife’s necklace when I was in New York and she was in Los Angles. She called me in a panic. She wanted to know if I could use my ESP. I saw images in my head. I told her I “saw” the necklace in “something soft and purple and gold.” She found it in a zipper compartment of a gym bag in my son’s closet with a LA Lakers logo — which is purple and gold — on it. But it has never helped me win the lottery. LC: Our parents were both Jewish and both embraced some form of Christmas ritual when we were young. Your mother, like mine, expressed some guilt over the practice. In my case, my father won the battle and erected a tree in the living room. You unwrapped presents that were found underneath the dining room table. That seems even less exciting than Hanukkah. Is the memory fond or fraught? ST: It’s a wonderful memory. It still makes me laugh. And you’re dead wrong about our Jewish Christmas being less exciting than Hanukkah. With Hanukkah you always had the dreaded night when you got tube socks. We got nothing but grade-A loot under the dining room table. The Great Garloo. A Kenner’s Skyscraper and Roadway kit. An Erector Set! LC: You’ve appeared in more than 100 films and more than 200 television shows, so people must recognize you instantly even if they can’t place you. Is there a role with which most folks identify you? And is there a role you’d wish they chose instead? ST: Ned from Groundhog Day is still number one. I’m also happy when people like parts I have played in lesser-known films, like Bossa Nova or Pope Dreams. Both are sweet, funny, well-made movies. Ned from Groundhog Day is still number one. But truthfully my favorite shout-out was when I was in New York doing a Law and Order: SVUepisode. I was waiting outside the hotel for the van to pick me up and take me to the set. A car drove by and slowed down. The window lowered as the driver yelled, “Hey. You’re Stephen Tobolowsky! Man, I love your stories!” And off he drove into the morning Manhattan mayhem.